We host seasonal events in locations across the UK where people get together and exchange their produce – bread for mint, mint for cupcakes, cupcakes for jam, jam for apples, apples for eggs. 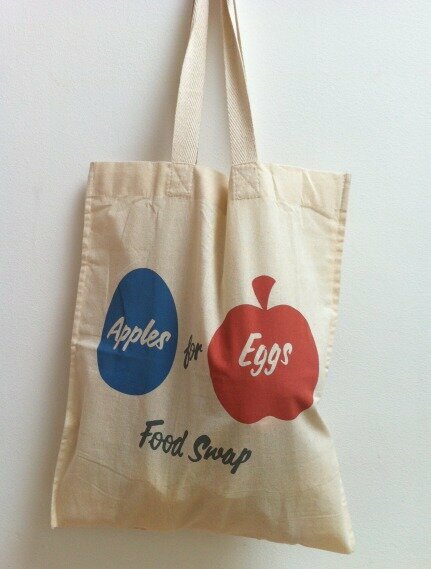 Apples for Eggs was set up by Vicky Swift and Sue Jewitt in 2011, initially as a Facebook page for people to post and swap their excess home produce. Inspired by Brooklyn’s BK Swappers and the LA Food Swap, they then decided to try face-to-face Food Swap events, and held the first Apples for Eggs event in autumn 2011 in Altrincham. Since then, our community has grown as people have decided to set up regular Apples for Eggs events in their towns and cities. We currently have swaps in seven different locations. Apples for Eggs is a social enterprise. Any income generated is used to cover costs where possible and enable our network to continue to grow across the UK.